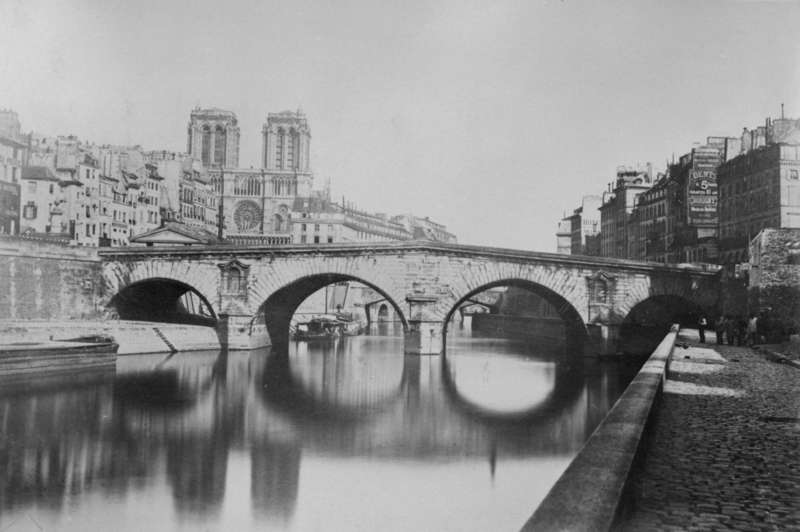 The Saint-Michel bridge, the Hôtel-Dieu, and Notre Dame Cathedral before 1857. 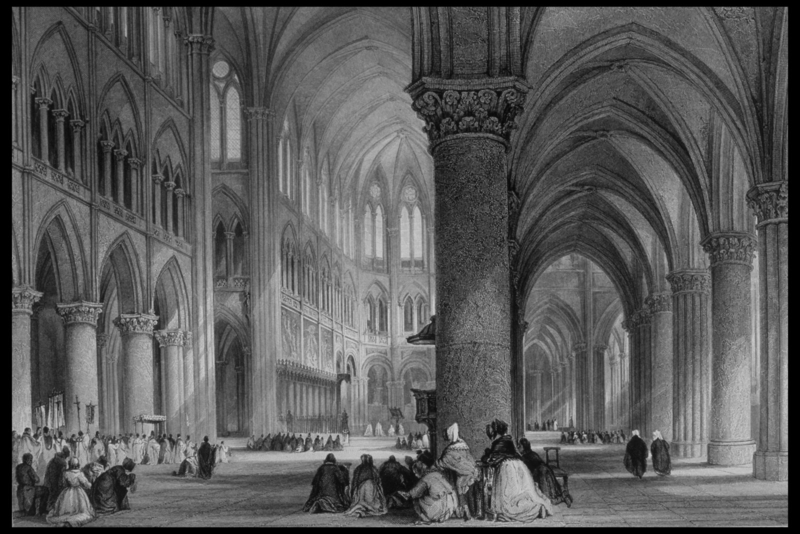 Interior of Notre Dame Cathedral as drawn by Thomas Allom from France Illustrated, 1845. 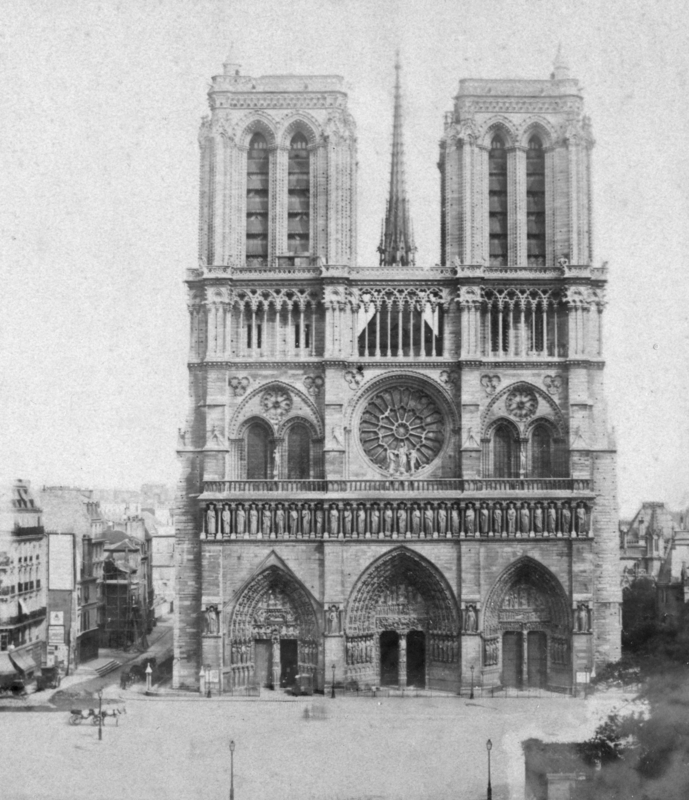 Notre Dame Cathedral photographed in the late 19th or early 20th century. 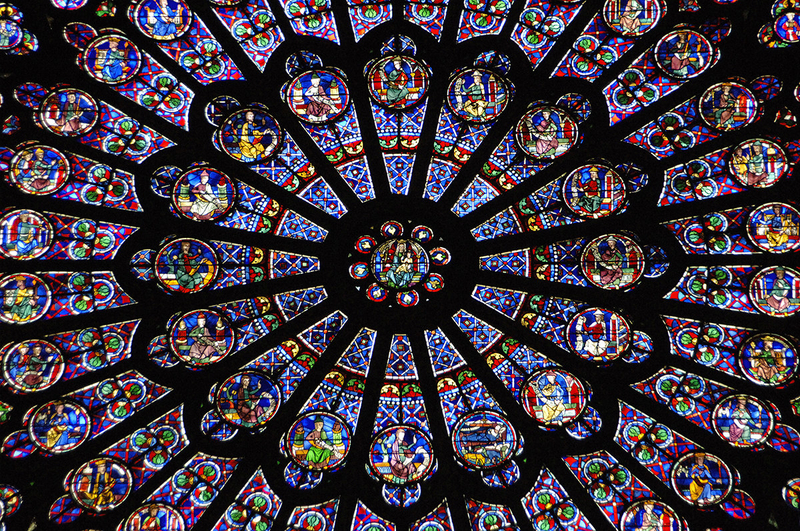 One of Notre Dame’s famous rose windows, on the northern side of the cathedral, dating to the 13th century. The cathedral’s exterior is adorned with sculptures illustrating biblical stories, known as the “poor people’s book,” as, historically, the majority of parishioners could not read. 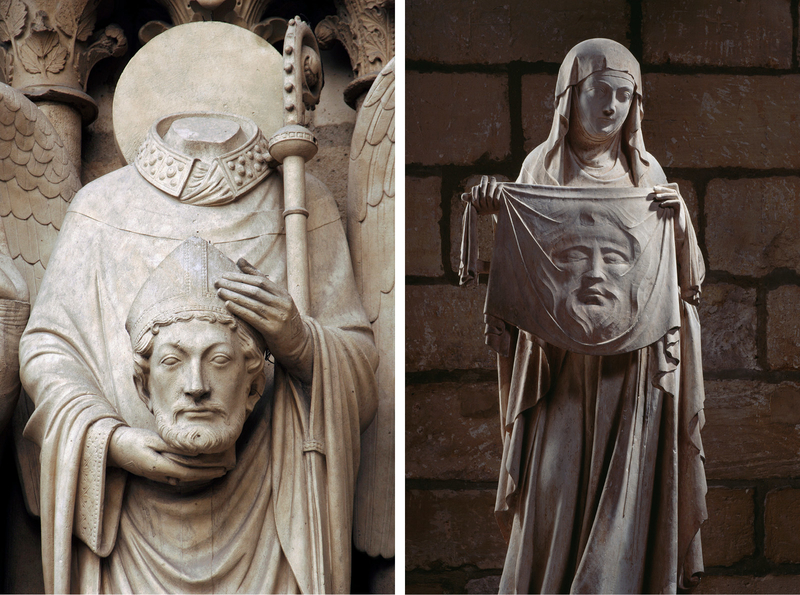 Left: Christian martyr Saint Denis holding his head. Right: Saint Veronique holding the shroud of Christ. 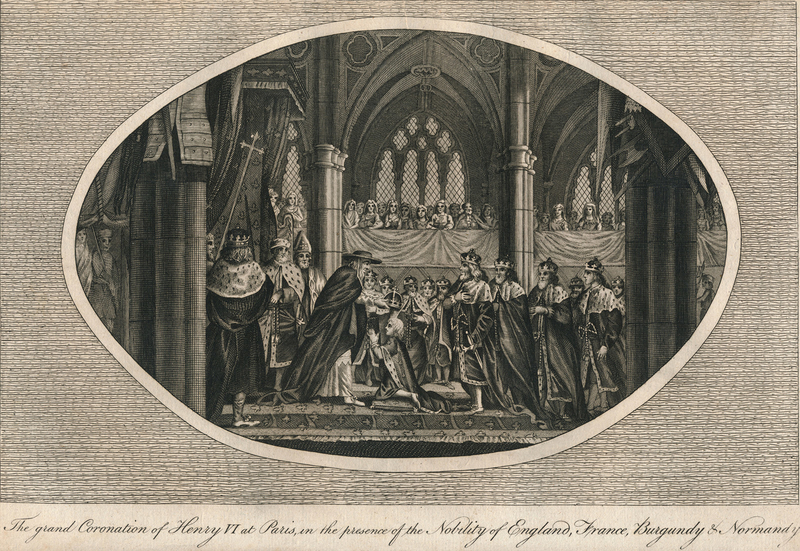 An artist’s rendering of Henry VI’s French coronation at Notre Dame in 1431 (artist unknown). 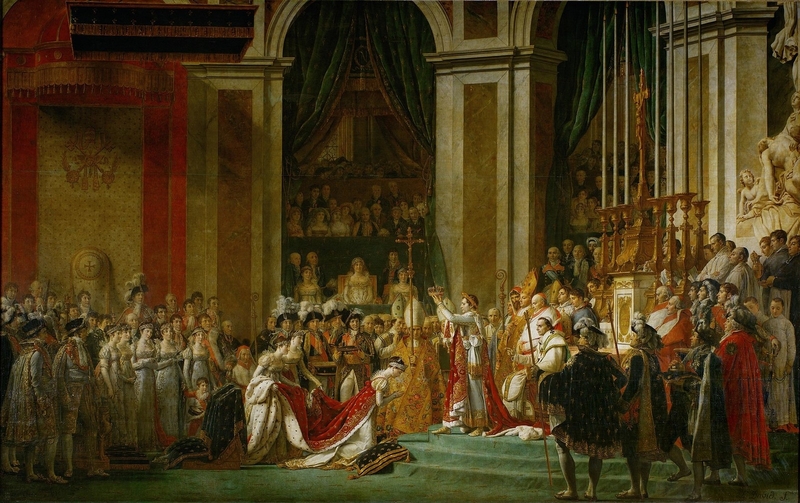 “The Coronation of Napoleon” (1807) by Jacques-Louis David, depicting the coronation of Napoleon I at Notre Dame in 1804. 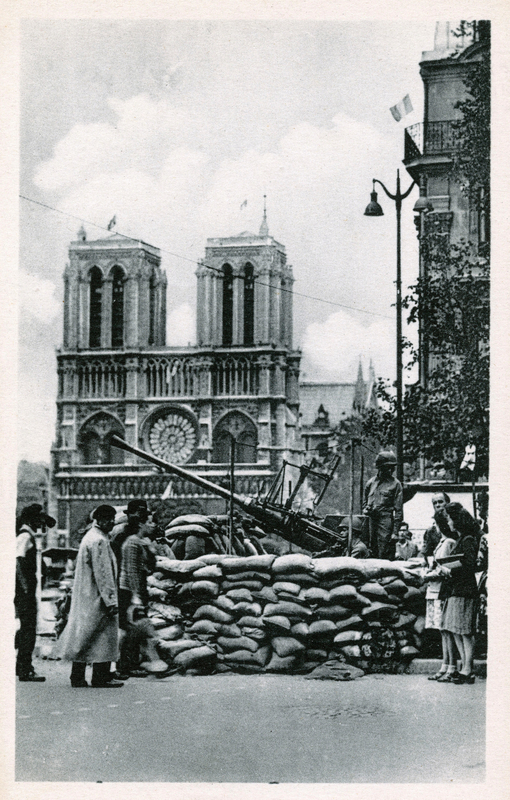 American anti-aircraft artillery in front of the cathedral during the Liberation of Paris, 1944. 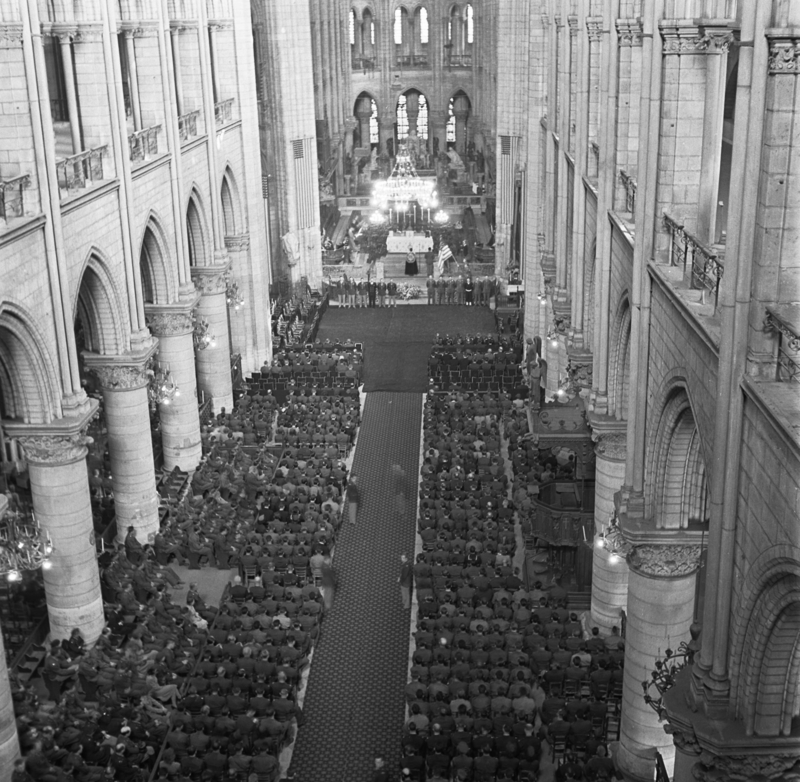 US soldiers fill the pews of Notre Dame Cathedral during the GI memorial service for US President Franklin D. Roosevelt on April 16, 1945. 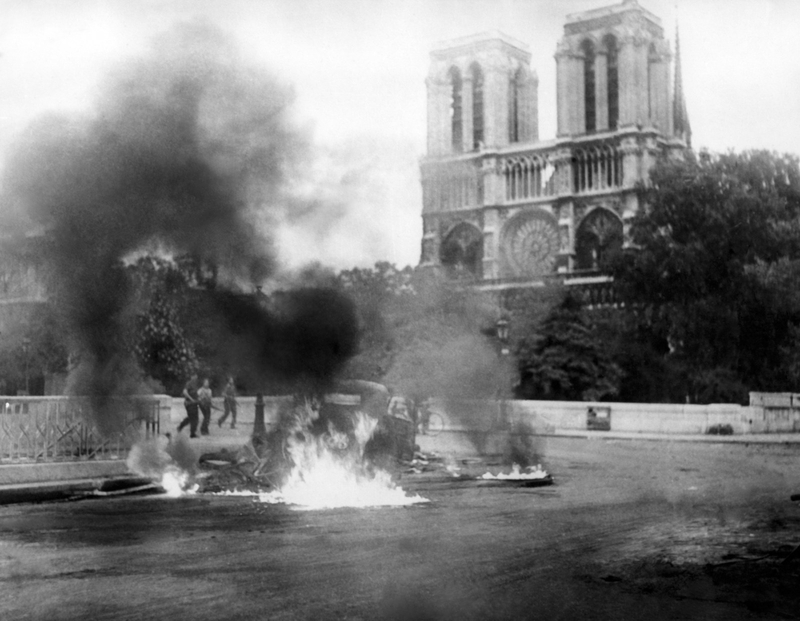 A photo taken of a flaming vehicle circa Aug. 23, 1944, close to the Pont Saint-Michel and Notre Dame Cathedral during the Battle of Paris, a few days before the city’s liberation on Aug. 25, 1944. 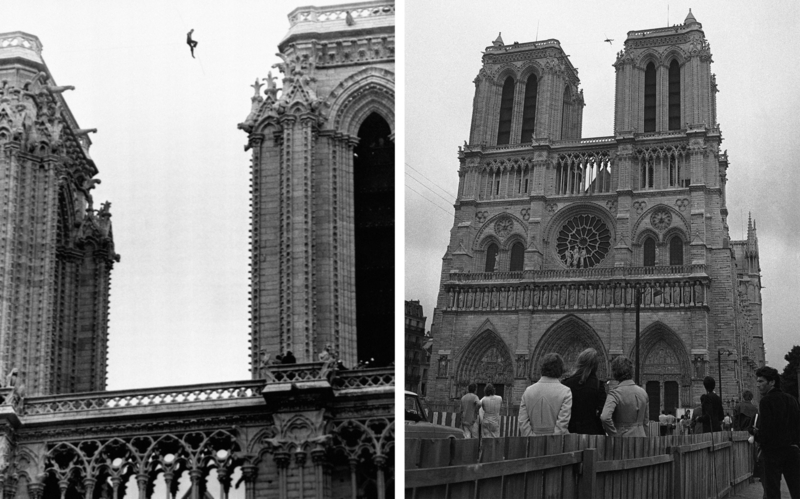 Philippe Petit, a 21-year-old professional tightrope walker, perches 225 feet above the ground, between the two towers of Notre Dame cathedral, Paris, on June 26, 1971, during a stunt which lasted several hours, with police unable to bring him down. 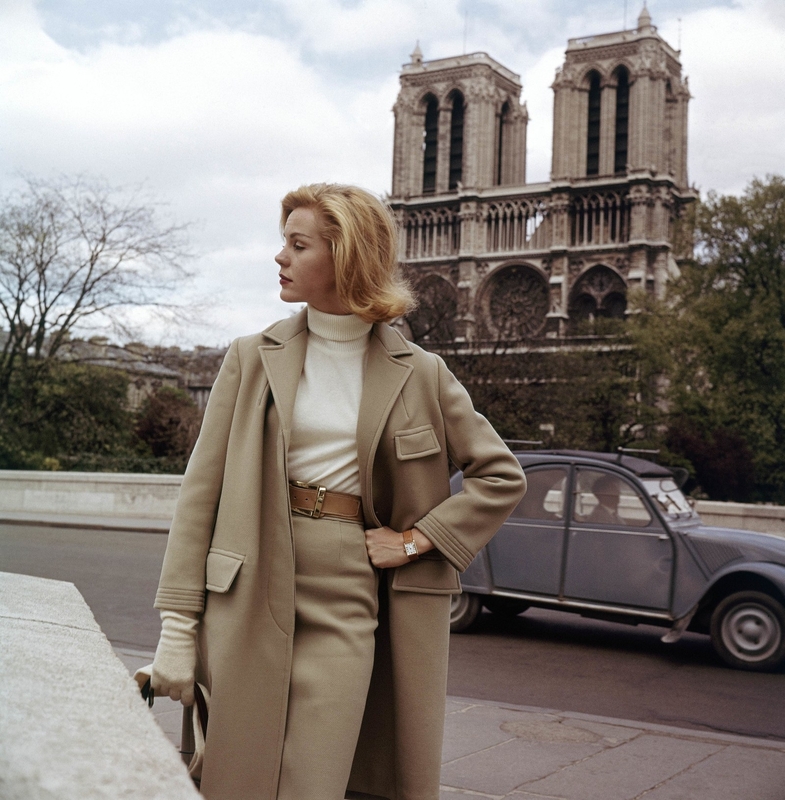 A model poses for a photo in front of Notre Dame Cathedral in 1961. 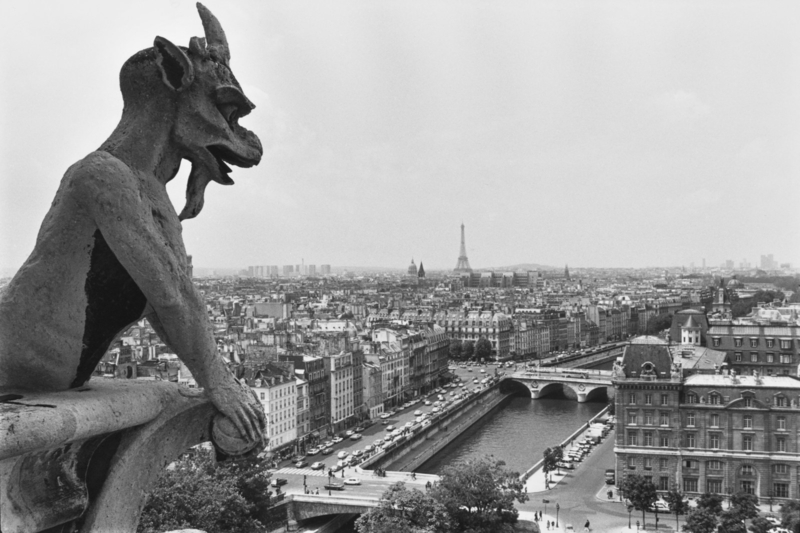 A gargoyle on top of the Notre Dame Cathedral photographed in July 1980. 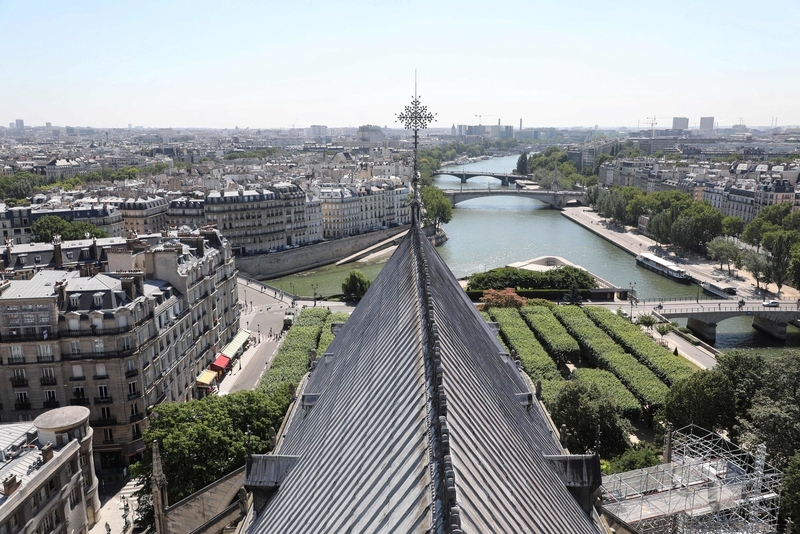 A view of the Seine river and its surroundings from the Notre Dame Cathedral on June 26, 2018. 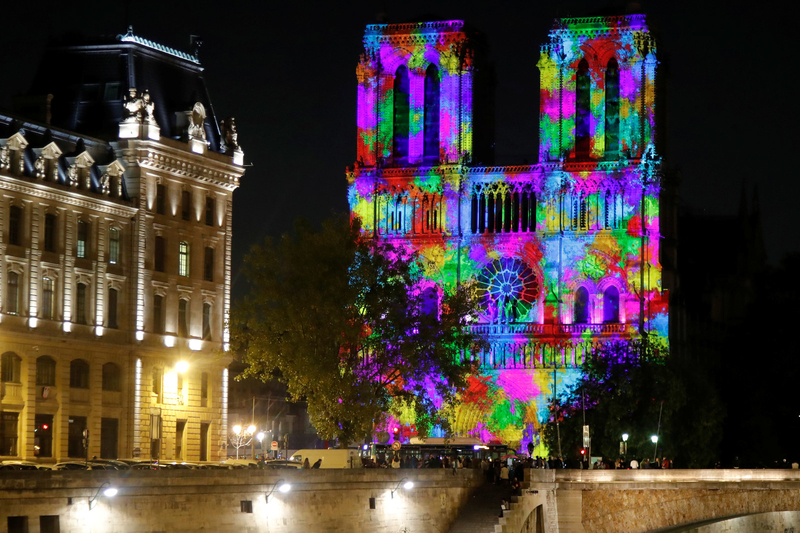 A monument light and sound show, named “Dame de Coeur,” by stage director Bruno Seillier, is projected on the facade of the Notre Dame Cathedral in October 2018. 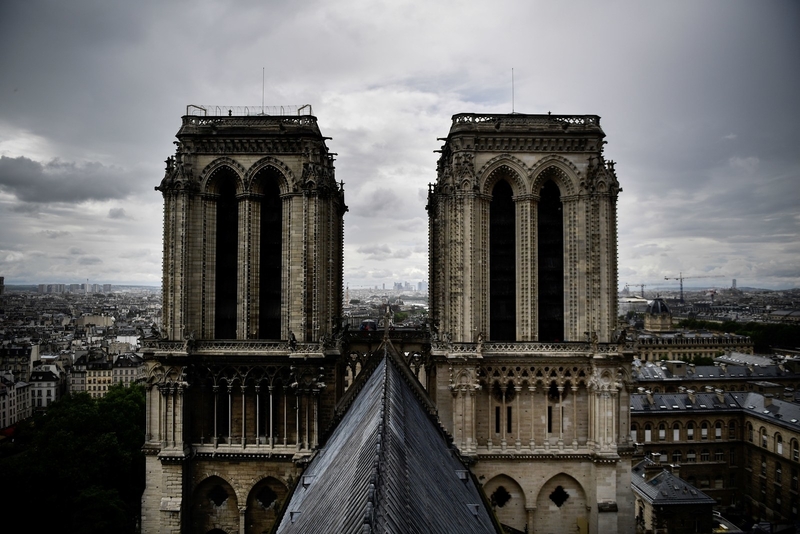 A photo taken on June 28, 2017 shows the roof of Notre Dame Cathedral, as the monument needs a huge restoration. 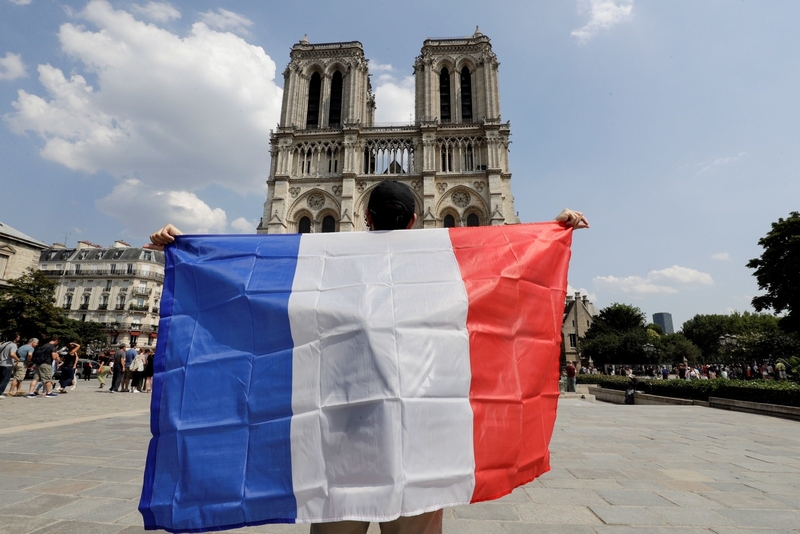 A France supporter holds a French flag in front of Notre Dame Cathedral, prior to the start of the Russia 2018 World Cup final football match between France and Croatia, in Paris on July 15, 2018. 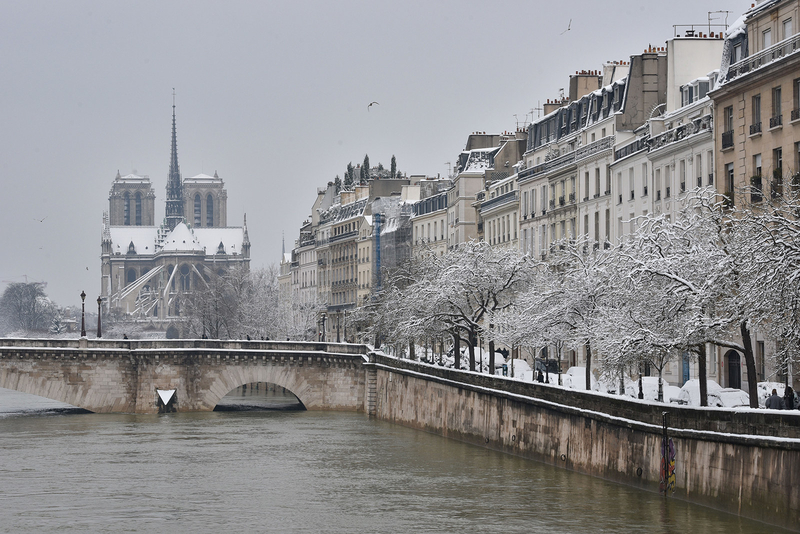 Snow blankets the bank of the River Seine and Notre-Dame Cathedral. 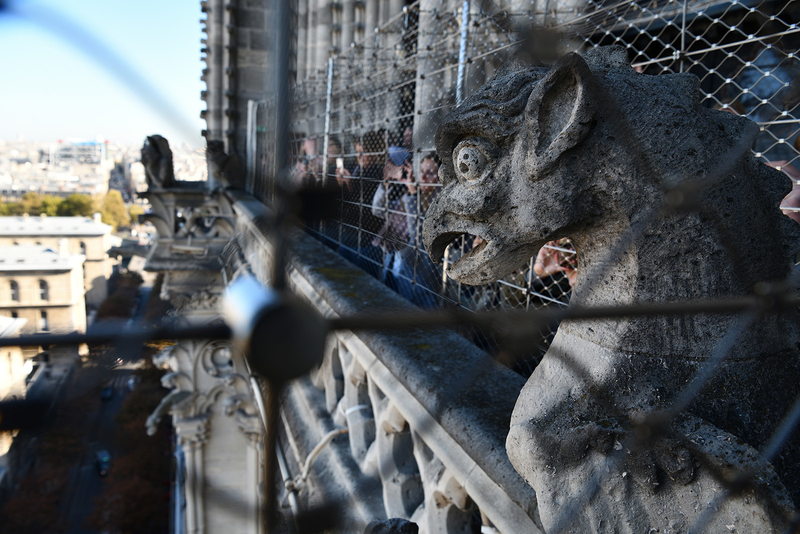 Tourists take in the view from the cathedral in October 2018. 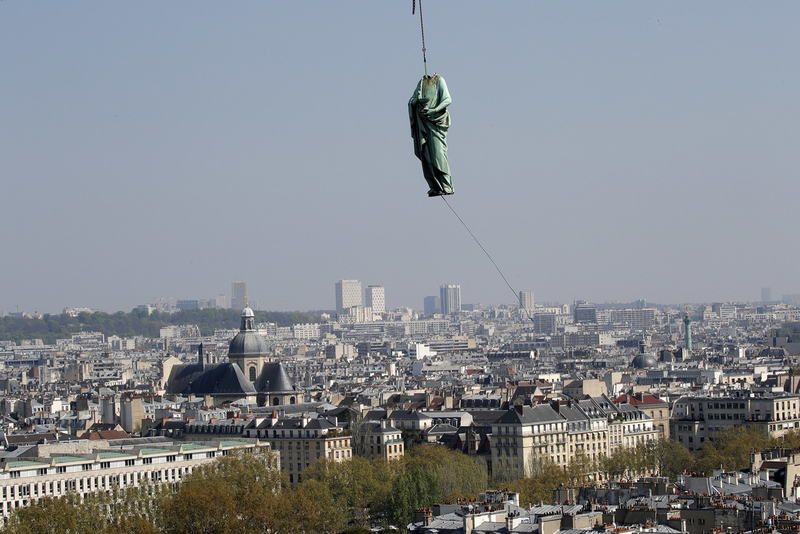 A statue of Saint John is removed from the spire of Notre Dame Cathedral by a crane before restoration work on April 11, 2019. 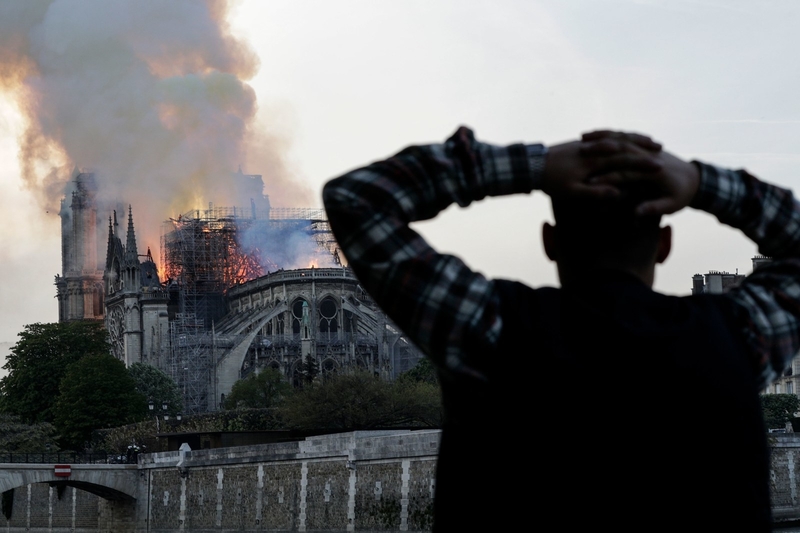 A man watches the landmark Notre-Dame Cathedral, engulfed in flames, in central Paris on April 15, 2019. 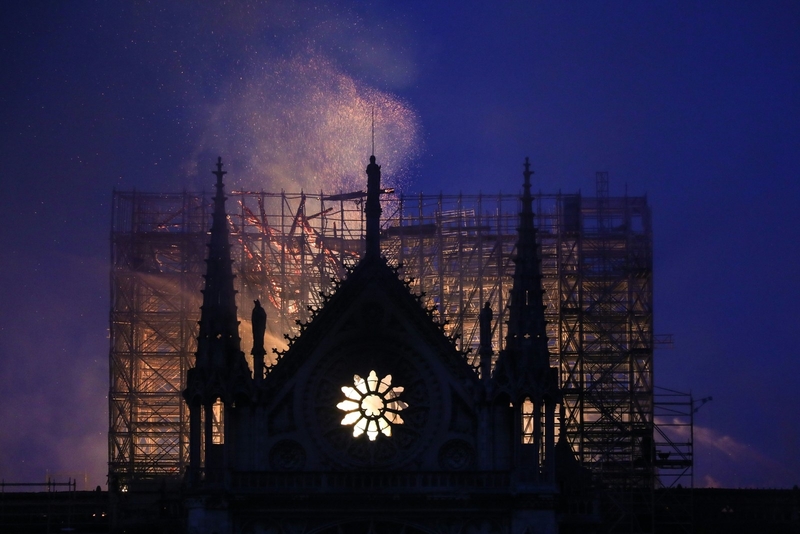 Smoke and flames rise during a fire at the landmark Notre-Dame Cathedral on the evening of April 15, 2019. A drawing of a fire at Chartres Cathedral was misidentified as Notre Dame Cathedral in an earlier version of this post; that image has been removed. 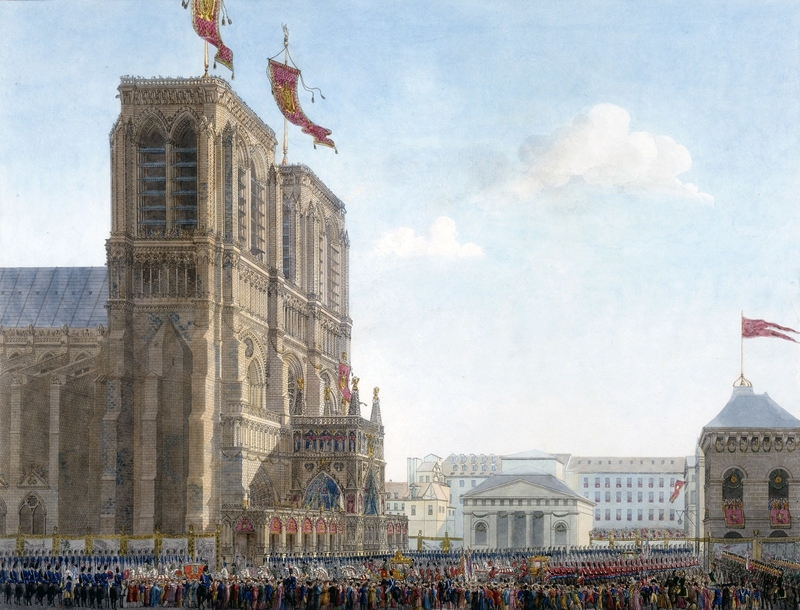 An image from artists Percier and Fontaine that was misidentified as portraying Notre Dame has been replaced. The date of the Liberation of Paris was misstated in an earlier version of this post.